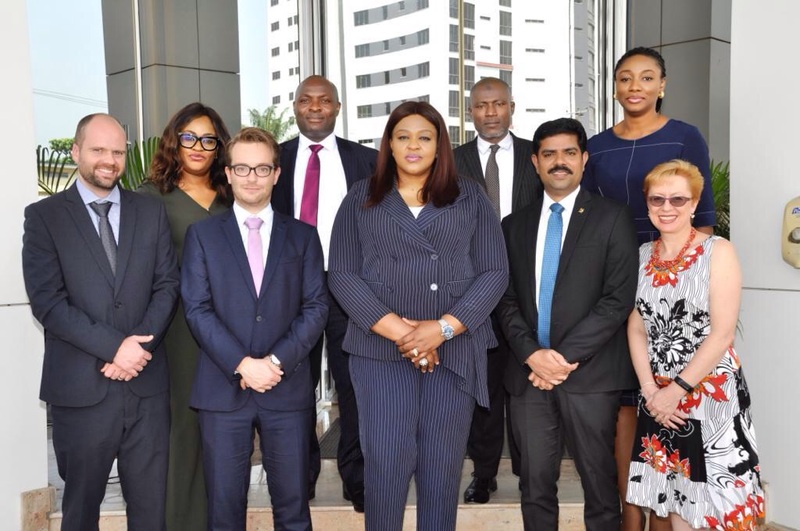 From Left: Front roll- Head Technical, Hollard Health, PR Du Toit; Business Development Director Africa, Cigna Global Health Benefits, Gilles Nyssens; Managing Director/CEO, NSIA Insurance, Ebelechukwu Nwachukwu; Head, Alternative Distribution, NSIA, Harish Damodaran; and General Manager Operations, Hollard Health, Lee-Ann Dobrescu. Back roll- Lead, Corporate Marketing, NSIA, Binta Eta; Executive Director, Marketing and Relationship Management, NSIA, Sunny Uwagboi; Executive Director, Technical, NSIA, Abideen Musa; and Product Development Consultant, NSIA, Titi Shodeinde during a visit by Cigna Hollard team to NSIA in Lagos. NSIA Insurance Limited has launched its new International Health Insurance product – NSIA Health Insurance – to the Nigerian Market. To deliver on all that is expected from an international health insurance offering, the underwriting firm partnered Cigna and Hollard. Cigna is a Fortune 500 company in the USA and one of the world’s leading providers of health benefits enabled through its 41,000 employees serving over 90 million customers all over the world. Hollard is South Africa’s largest independent insurance company, with an ever-growing African footprint making it known throughout the continent for its innovative approach and customer-centric brand. A statement from the firm stated that the health insurance provides a robust health plan to local companies who want to provide their Staff with access to quality healthcare in Nigeria and beyond as well as multinationals operating in Nigeria who desire to harmonize their health insurance plan across Africa. It noted that the staff of these companies once enrolled, are able to access the finest quality health care available all over Africa and the rest of the world whenever they need such services. According to the Managing Director, NSIA Insurance, Ebelechukwu Nwachukwu, NSIA Health Insurance is one of a kind. She posited that companies that purchase the product are rest assured that their staff will easily access the best medical services, wherever they are in the world, when the need arises. This is a promise that is already being fulfilled by our technical partners in Nigeria and other parts of the world where they operate, she said, adding that already, a number of leading Multinationals in Nigeria have signed on to NSIA Health Insurance with many other prospects in the pipeline. NSIA Health Insurance will take into consideration the different Health Insurance needs of organisations, whether they operate in one African country or many, or whether they are looking to cover key local staff or expatriates or both. The product offers a combination of health plans that provides optimised coverage that can be aligned to a company’s budget. NSIA Insurance is excited about this addition to its portfolio of products, which affords it the opportunity to meet more of the insurance needs of its increasing customer base. The Company is one of the most progressive composite insurance companies in Nigeria, with its head office located in Lagos, a strong regional presence in Abuja and large network in every strategic state. NSIA offers a wide range of insurance services to meet the changing financial, investment and lifestyle risk needs of corporate, commercial and individual customers, at competitive price and with the best service infrastructure to ensure value to our clients. NSIA Insurance Limited was incorporated originally as African Development Insurance Company in April 18, 1989, as a Limited liability company domiciled in Nigeria and licensed to underwrite all classes and volumes of general and life businesses. It became ADIC Insurance Limited in October, 2006 after Diamond Bank Plc acquired 96 per cent equity stake. In 2011, NSIA Participations successfully acquired ADIC Insurance Limited (Now NSIA Insurance Limited). NSIA Participations has presence in 12 countries which includes Cameroun, Congo, Gabon, Benin, Cote d’Ivoire, Ghana, Guinea Bissau, Mali, Nigeria, France, Togo and Senegal. Building on the existing strength and over 20 years experience of ADIC Insurance, NSIA Insurance Limited has grown tremendously to become one of the leading distributors of insurance products and services in Nigeria. The Solvency Capital of NSIA Insurance stands at N10.7 Billion as at 2017 and total asset base is N15.5 billion and it is one of the most capitalized companies in the insurance industry. NSIA’s partners benefit from its simple and cost efficient administration processes, and highly experienced team who collectively put their knowledge to work to create value and ensure the satisfaction all of its Stakeholders.